While most of us wouldn't mind looking a few years younger, the prospect of letting a surgeon take a scalpel to your face is hardly appealing, in fact for some of us; it can be quite an alarming thought! In the last few years, more information about acupuncture facelift appeared in various papers and magazines described as a "viable alternative to cosmetic surgery," the "beauty acupuncture". In fact cosmetic acupuncture has been performed for thousands of years in China; it has become more popular both in China and in the west. This non-invasive procedure designed to treat fine lines and wrinkles, as well as improving the overall appearance of the skin. It is said to be the secret beauty weapon of a number of A-list stars including Madonna, Gwyneth Paltrow and Demi Moore, facial rejuvenation acupuncture is a cheaper and safer alternative to Botox and cosmetic surgery. A course of treatment can, without risk, eliminate under eye bags, sagging jowls and many other wrinkles caused by years of stress. Facial rejuvenation acupuncture triggers the body's own mechanisms to repair and reconstruct the collagen fibers, and strengthen and rehydrate the subcutaneous muscle. As the treatment affects the energy balance of the whole body, so it's a treatment for both inside and out. In a session lasting around one hour, a therapist will insert very fine, sterile needles into particular acupuncture points on the face which, manipulates the body's energy (QI), boosts circulation, helps the lymphatic system drain away toxins and stimulates the production of new collagen. Needles are placed strategically to tighten sagging muscles at the jaw, neck, and smile lines. 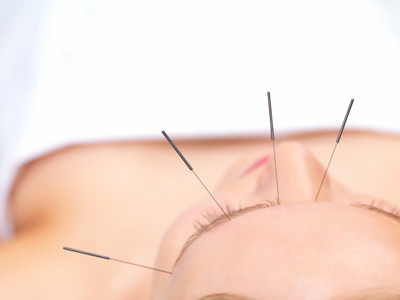 Additional ordinary acupuncture needles are also placed in the hands and feet to balance the effect on the head. With the pressure points stimulating the body's healing energies and increasing blood flow, the skin automatically tightens and becomes smoother in appearance. Fine lines may be entirely erased, deeper lines reduced, and bags around the neck and eyes firmed. Other positive side effects of the treatment include stress reduction, removal of sinus congestion, and a reduction in acne. The needles placed in your hands and feet may also help with other physical ailments, and you should discuss such disorders with your acupuncturist prior to treatment. A course of 10-12 sessions are suggested to achieve the best result. Initially 2 sessions a week for 3 weeks, thereafter once a week. To maintain the result, a maintenance session may be needed once 4 or 6 weekly according to individual's response.